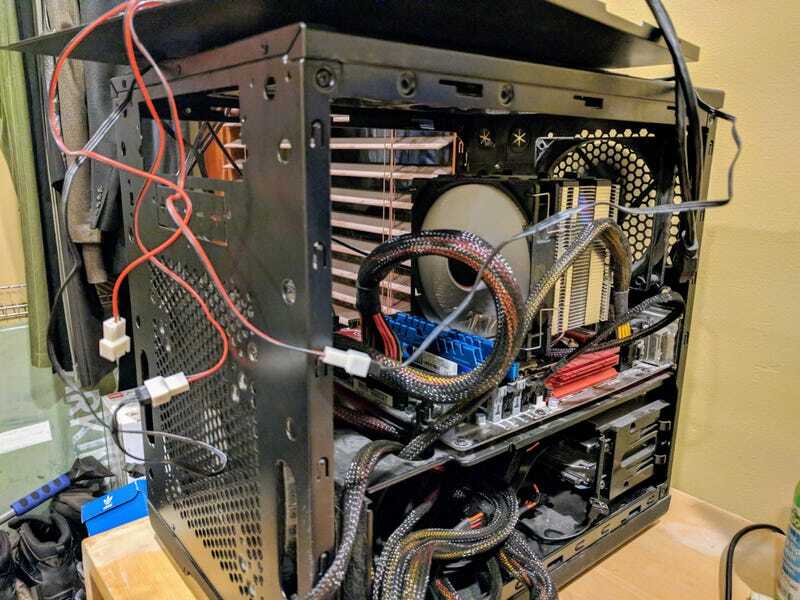 This is my homebuilt PC that’s going on three years old. It doesn’t normally look like this, but I’ve torn it apart to try and fix an issue that popped up a couple weeks ago. About two weeks ago, I went to boot up my computer to do some work. It powered up, but no signal at the monitors. The motherboard speaker didn’t so much beep as it did tick. And it just sat there, ticking endlessly. So I held the power button down until it shut off and attempted to power it on again. This time it booted and I got a BIOS message informing me of the previous failure to boot. I opted to reset everything and boot and Windows 10 came up just fine. I did the work I had to do and shut the computer off. The next day, I had more work to do, so I went to boot it up and got the same blank screen and rhythmic tick from the motherboard speaker. Power down, reboot, same thing. Tried a couple more times and gave up. Just now getting around to tearing it down and putting everything back together in an attempt to diagnose the problem. I’ve found that with the RAM removed, I get a rapid-fire series of beeps. With the RAM installed I either get the blank screen and tick, or it boots and I can get into BIOS and Windows. Same results with either one or both sticks installed. Based on what research I’ve done, it seems to me my RAM is bad. I don’t have any extra DDR3 sitting around to test that theory though. Currently only the CPU, RAM, and SSD are installed and I went through the CMOS reset process.